“Hidden beauty” – that would be another way of expressing “Elusive Beauty”, the title of Schunke’s new recording. This is the most radical album to date by Schunke, who comes from Berlin and who has been seen as a visionary of Latin Jazz, ever since his debut CD “Symbiosis” which he recorded in New York in 2000 together with Antonio Sanchez and John Benitez. It’s a reputation that was masterfully reinforced by his album “Genesis, Mystery and Magic” of 2014. This recording, with stars from Europe and the USA including Nils Wogram and Alex Sipiagin, drew Schunke into 5-star album reviews of the most important publications worldwide, and the German magazine Jazz thing hailed it as a masterpiece. But after this big success, which drew on all Schunke’s previous creative work, creating a bridge between Latin culture, progressive jazz and European classical music, the pianist thought it was time for a break. “I wanted to rediscover the piano for myself and not be limited, to be unbounded, so to speak,” the 44-year-old pianist said. 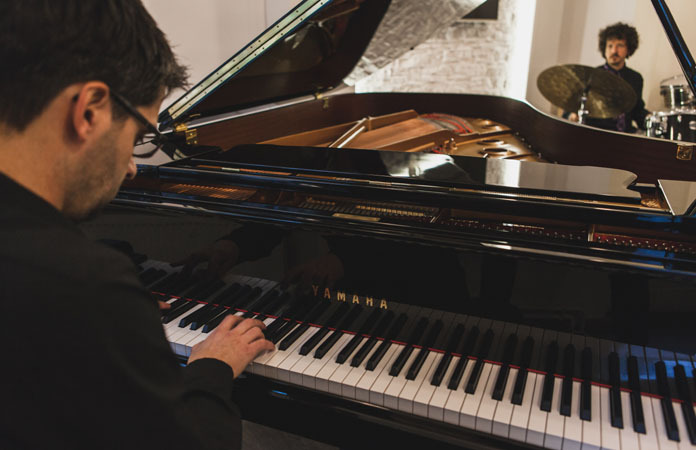 The result of years of piano and music research and soul-searching, during which Schunke drew inspiration from such different figures as the British composer Harrison Birtwistle or the US percussionist Tyshawn Sorey, can now be heard on “Elusive Beauty”. For the first time in his career, Schunke has dispensed with a bassist, who in Latin jazz is generally an indispensable pulse-provider, thus opening up previously unheard spaces in the depths of the piano register. Four of the seven pieces on “Elusive Beauty” are duets with the Uruguayan percussionist Diego Pinera, whom Schunke has valued as a reliable partner for more than ten years. But even the extremely virtuoso rhythmist, who was awarded the “Echo Jazz” of 2017 as the best percussionist, is drawn out of his comfort zone. It is no longer enough to make complex, uneven Latin grooves fly (Schunke’s trademark since the start of his career), but it is also a question of thinking in musical categories. With the utmost sensitivity, Pinera coaxes drops of sound out of a sea of percussion instruments such as steel drums, timbales, kettle drums or countless cymbals, and makes them sing. On three of the tracks on “Elusive Beauty”, an unusual combination of instruments joins the duo. Bass clarinetist Benjamin Weidekamp, who has worked with Anthony Braxton and Gebhard Ullmann, among others, violist Yodfat Miron and cellist Boram Lie, who are supremely at home in the worlds of classical music, new music and pop, provide additional excitement. Far away from wind and string clichés, they strike Schunke’s harmonic tinder and light flickering fires. The scale of expression varies from mere noises, lips smacking and sighs, to a warming blanket of musical cloud with deliberately woven imperfections, to the incredibly intensive solo scream of despair by the bass clarinet. It sounds like a bruitistic repetition of Cuban grand master Paquito d’Rivera’s clarinet; he and Schunke recorded the CD “Back in New York” in 2008, and it makes it obvious what a huge leap the pianist’s musical ideas have taken in recent years. Schunke did not locate his “Elusive Beauty” in the vacuum of the avant garde. Traditional Latin American rhythms keep turning up in new tracks by Schunke, who regularly performs in South America. You can hear plena from Puerto Rico in the lead-in number “Rapsodia No. 3”, or son from Cuba as in “Back to Life – Part II”. And although Schunke and Pinera interpret their grooves in truly daring sequences of uneven beats, they set the listener dancing inwardly. What is happening here is the improbable symbiosis of apparent contrasts. The mathematical precision of advanced Latin jazz, the passion of Latin American folk culture, and the harmonic understanding of European modernity influenced by Schönberg and Webern, have all led to the creation of something new. To a certain extent this is a development of the “Third Stream” movement started by Gunther Schuller, which extends the blend of jazz and classical music by a Latin component in Schunke’s “Fourth Stream”. On “Elusive Beauty” a fragile beauty has been preserved whose harmonic form is made to shine in dark colors thanks to the oscillations of a delightfully dissonant chordal note. And we witness the birth of a special musical and compositional idiom which could become something quite new for Latin jazz, just as Ornette Coleman’s revolutionary musical philosophy did for the hard bop of the late 1950s that had become so set in its ways. All in all: in the most delightful way, on his seventh album Sebastian Schunke lives up to his reputation as a bold innovator.